THE Sisters of the Good Samaritan of the Order of St Benedict, an Australian order, have celebrated the first perpetual profession of a woman from the Republic of Kiribati. Sr Ameria Etuare made her perpetual profession at the Sacred Heart Cathedral on South Tarawa, Kiribati’s most populous island, on May 23. The Good Samaritans’ congregational leader Sr Clare Condon was there to accept Sr Etuare’s vows. “You have journeyed and continue to journey like a canoe across the oceans and the waters,” Sr Condon said to Sr Etuare during the ritual. The Republic of Kiribati is a series of low-lying coral atolls in the Pacific Ocean on the equator, where canoe travel is common. Sr Condon noted that just as one steers the canoe by looking to the clouds and sun or stars, Sr Etuare has looked to the Scriptures, the Rule of Benedict and the charism of the founder of the Good Samaritans Archbishop John Bede Polding “to keep you faithful and to bring you home to your heart where the God of love resides”. The Good Samaritans believe this was the first celebration of the Benedictine perpetual profession rite in the Pacific. Good Samaritan Sisters, family, friends, colleagues and other religious packed the cathedral for the profession. 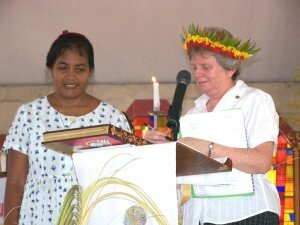 Bishop Paul Mea MSC, the bishop whose persistent invitation to the Good Samaritans about 20 years earlier had brought “the Good Sams” to Kiribati to teach in the Kiribati Pastoral Institute, presided at the profession ceremony. The rite of profession is ancient, dating back 1500 years to the time of St Benedict. Sr Etuare made her request and Sr Condon reminded her of the seriousness of her commitment and that it had to be made in complete freedom. Sr Etuare promised to follow the Good Samaritan way of life and then vowed to God stability, conversion of her life and obedience. According to custom, the celebration continued in a local maneaba – the meeting house and traditional decision-making mechanism within the I-Kiribati community – at the feast known as the botaki, where dancing, feasting and speech making are the order of the day.